Alexander Shulgin deemd the decision "unlawful because less than half of the OPCW Convention signatories supported it"
MOSCOW, February 11. /TASS/. Moscow has no plans to fund steps the Organization for the Prohibition of Chemical Weapons (OPCW) will take to create an attribution mechanism, and will demand the return of its share of unspent budget funds, Russian Permanent Representative to the OPCW Alexander Shulgin told the Rossiya-24 TV channel on Monday. "We consider the decision to establish an attribution mechanism to be unlawful because less than half of the OPCW Convention signatories supported it. The decision is not in line with the Convention so we have no plans to associate ourselves with it and fund activities to create an attribution mechanism," he said. "We made it clear at a conference session in November last year that we will demand that our share of unspent funds from the OPCW’s 2016 budget be returned, while the Technical Secretariat plans to spend it on forming an attribution team," the Russian envoy added. Shulgin also said that the Russian delegation was not alone in its stance. According to him, many delegations representing "our allies, sympathizers and like-minded" countries share this view. "We have other issues to work on, but first of all, we will continue our efforts to prove that attribution attempts are harmful and there is no place for them within the OPCW," the Russian envoy emphasized. 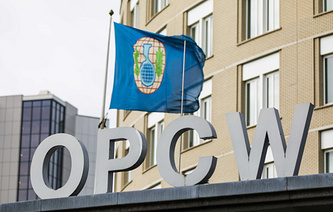 In November 2018, the OPCW decided to increase the organization’s budget by 2.4 mln euro to 69.7 mln euro. The additional money is particularly planned to be spent on the establishment of an attribution group. Russia strongly opposed the move, pointing out that granting attributive functions were granted to the OPCW, the question of the organization’s infringement upon the exclusive prerogatives of the United Nations Security Council would arise. Russia also noted that the Chemical Weapons Convention did not mention any attribution mechanisms. As many as 82 out of the 193 states supported the initiative, while 24 countries, including Russia, China, India, Iran and Kazakhstan, voted against it and others abstained. The initiative’s opponents stressed that the mechanism would duplicate the UN Security Council’s activities and undermine the very essence of the OPCW, which had always been focused on technical work.